Grissel Gold is 238 years old today, born in 1773 Grissel is the boys' 6th great-grandaunt and the wife of Seth Sturgis Jr. Grissel is the second youngest daughter born to Abel Gold and Ellen Burr, of their 11 children. Grissel's older brother and 3rd child is Talcott Gold. The Gold family looks like this: John Gold ( 1755-1755), Abel Gold Jr. (1756- ), Talcott Gold (1759-1836), Ellen Gold (1761- ), Samuel Gold (1763- ), Isaac Gold (1766- ), Esther Gold (1768- ), Nathan Gold (1770- ), Seth Burr Gold (1775- ), Grissel Gold (1773- ), Hannah Gold (1777- ). The spelling of the Gold name was many times spelled Gould. Even in some military records. Even though Gold or Gould is often a Jewish name, our Gold family was mostly members of the Presbyterian and Congregational Church in Friendship, NY. There is much more about the Gold family in the Powers-Banks Ancestry Book, found on line by doing a Google search. An Excerpt from the book about the Gold's : Powers-Banks Ancestry Traced in All Lines to the Remotest Date Obtainable, Charles Powers, 1819-1871, and His Wife Lydia Ann Banks, 1829-1919 By William Howard Powers: "The wife of Bradley Banks was Sallie Gold The first of the line was Nathan of Fairfield There were Golds also in Massachusetts but the relationship to the Connecticut family has not been determined The English origin of the Massachusetts Golds has been determined Several wills of the family are found in Waters's Gleanings Nathan Gold of Fairfield is said to have come from Bury St Edmunds Southwest of Bury is Hertford the home of the Massachusetts Golds Among them there were Nathans one indeed coming to this country but said by BA Gold to have settled in Amesbury he was of the same age as Nathan of Fairfield 1 Our family was mingled with the Golds when Bradley Banks"
Talcott Gold is 252 years old today, born in 1759. This is written about Talcott - "On his arrival in Friendship, his dependable qualities appearing, he is chosen town clerk, a life office. He and his daughters and wife are chief supporters of the Presbyterian church; when a Congregational church is formed in 1830, his name heads the list of members." excerpt from the Powers - Banks Ancestry page 188. The first USS Alliance of the United States Navy was a 36 gun sailing frigate of the American Revolutionary War, notable for having fired the last shot of the war. Originally named Hancock, she was laid down in 1777 on the Merrimack River at Salisbury, Massachusetts, by the partners and cousins, William and James K. Hackett, launched on 28 April 1778, and renamed Alliance on 29 May 1778 by resolution of the Continental Congress. Her first commanding officer was Capt. Pierre Landais, a former officer of the French Navy who had come to the New World hoping to become a naval counterpart of Lafayette. The frigate's first captain was widely accepted as such in America. Massachusetts made him an honorary citizen and the Continental Congress gave him command of Alliance, the finest warship built to that date on the western side of the Atlantic. 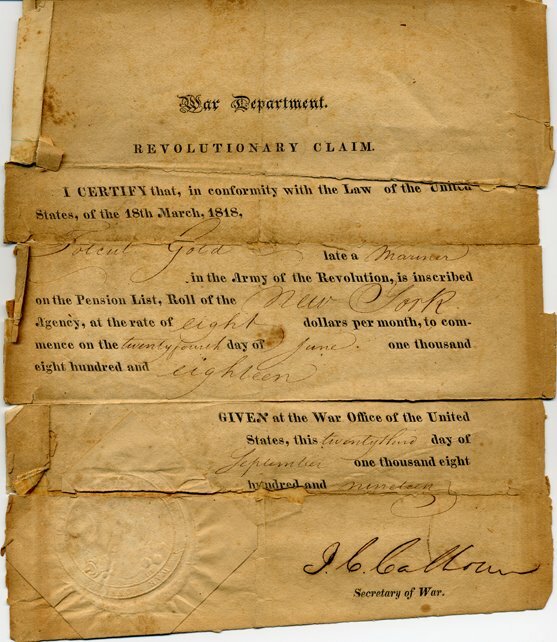 The following is a photo copy of the original document given to Talcott Gold as his pension from the war. Thomas Martin Galt died 10 years ago today in 2001 in Muleshoe, Bailey, Texas at age 97. He was born on Dec 4th 1903 in Little Rock, Ark. Thomas is the boys' 2nd cousin 3 times removed. He still has living family that I can't account for. His parents are Thomas Resin Galt and Florence May Brown. Thomas Resin Galt is the boys' 1st cousin 4 times removed. His parents are James Junius Galt and Mary Ann Brown, the boys' 3rd Great-grandaunt. Mary Ann's parents are Resin D. Brown and Rachel Earnest, the boys' 4th great-grandparents and also the parents of Charlottle Brown, Lottie Ray's mother. Margaret Jaeger died 119 years ago today in 1892 at 15 days old in Oak Harbor, Ottawa, Ohio. Margaret is the boys' 3rd cousin 3 times removed, her mother is Helen Altana Powers, their 2nd cousin 4 times removed and her mother is 1st cousin 5 times removed, Lydia Ann Banks. Lydia's father is David Bradley Banks the boys' 4th great-granduncle and 1/2 brother of Samuel Cheney Cotton via their common mother Sally Gold, the daughter of Talcott Gold and Anna Barlow. Elizabeth Stone died 274 years ago today in 1737 at age 86 in Stow, Middlesex, Massachusetts. Elizabeth is the wife of the boys' 9th great-granduncle, Samuel Stowe, the brother of Mary Marie Stowe who married the Rev. John Cotton and are the boys' 9th great-grandparents. Mary and John begot Samuel Cotton in 1676. Mary Magdelaine Brock is 231 years old today, born in 1780 in North Sewickley, Lancaster, Virgina. She is the boys' 5th Great-grandmother, and the wife of Abraham Le Fevre. Their children are Sarah (1799-1847), Isaac (1801-1890), Jacob B. (1803-1880), Mary Magdelaine, the boys' 4th great-grandmother (1806-1883), Nancy (1813-1865) and Daniel (1819-1896). Mary Magdelaine Le Fevre married James Johnson on March 4, 1824 in Salem, In. They begot 10 children, the fifth of which was Amanda Johnson, the boys' 3rd great-grandmother. Amanda married Andrew J. Wooden and begot 6 children, Joseph R. Wooden (1860-1931), Steve's great, great-grandfather, Jeremiah Wooden (1862- ), Elba Wooden (1863-1927), Minnie Hodges Wooden (1866- ), Lola Wooden (1873- ) and Harry Wooden (1879-1939). Stella Mae Dobbs is 92 years old today, born in 1919 in DeKalb, AL. Stella is Ella and Mason's 2nd cousin twice removed. Stella's parents are Charlie Hubert Dobbs and Ella and Mason's 1st cousin 3 times removed, Minnie Gertrude Burt. Minnie's Parents are John Henry Burt and Lillie Jane Hulgan. Charlie Dobbs' parents are Lodowick A. Dobbs and Cornelia J. Burt. Paula Carreth is 39 years old today, born in 1972. Paula is the kids' 2nd cousin once removed. Her father is L.J. Carreth, the kids' 1st cousin twice removed, whose mother is the kids' great-grandaunt, Melba Cora Myer, the sister of the kids' great-grandfather, Roland Max Myer. John Rolf Starling died 75 years ago today in 1936 at the age of 78. He is buried in Barbee Cemetery, Lone Star, Texas. 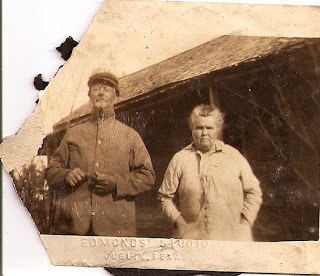 John, born in 1857, is the kids' 3rd great-granduncle, the brother of Alice Cora Starling, who was the last of the 11 children born to William B. "Wiley" Starling and Augusta Ann Powers, the kids' 4th great-grandparents in 1878, 21 years after her brother John. Sam Oliver Thurmond, jr. is 69 years old today, born in 1942. Sam is the husband of the kids' 3rd cousin twice removed, Glenda Elaine Meyer. Glenda's father is 2nd cousin 3 times removed, Arthur Herman Meyer whose father is 1st cousin 4 times removed, Dedrick Hammond Meyer. Dedrick Hammond Meyer's father is John Hammond Meyer, the kids' 3rd great-granduncle and brother of their 3rd great grandfather, Dedrick Henry Meyer, born in 1852.